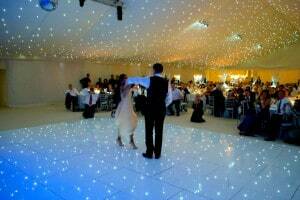 We have a range a different flooring materials available to complete your marquee, whatever the season. Inside Outside marquee flooring systems provide a robust, level and smart cover that not only looks great but also protects you and your guests from muddy or rough ground. In choosing your marquee flooring you will need to take into account the size and type of event, the location of your marquee and the ground conditions and also the time of year. If the ground at your chosen venue is uneven we can level most surfaces by installing solid hard standing flooring making your floor totally secure and even. 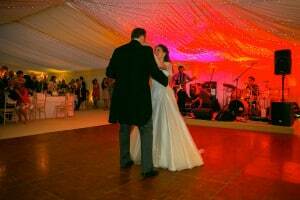 A dance floor will often become the focal point of any event whether it’s a wedding, party or corporate function. 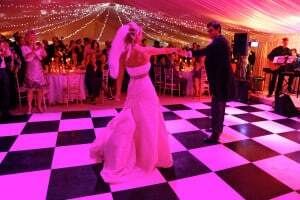 We have a wide selection of dance floors available with over 4,500 square feet of panels in stock, to suit all types of event and budget. Mirror – create a stir with a mirrored floor! LED colour change and video flooring – go all out and create a WOW with our state-of-the-art floor effects. A platform or stage creates a raised area which is ideal for bands, orchestras, presentations and speeches, or can be used to create tiered effects for a more versatile interior layout. We have steel deck platforms that can be raised to varying heights (up to 0.5m), and are smartly finished with a carpet covering.